The economy is a lumpy place. 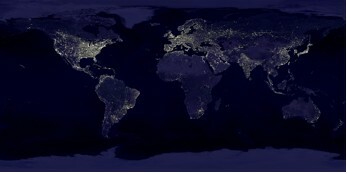 Looked at from afar or up close, economic activity is not smoothly spread – a point that the 1000-word picture of the earth at night makes clearly. Most of our economic theories, however, assume that small changes in circumstances lead to small changes in outcomes. This theory-practice gap is familiar to amateur readers of theoretical physics. For three centuries, Newtonian mechanics told us that mass and energy were smooth, continuous. And this worked impeccably at the level of aggregation available to empiricists of the time. In reality, however, the physical world – seen at the sub-atomic level – is mostly empty. Even the densest matter is mostly space. All the energy and mass are concentrated in lumps that are tiny relative the structures they constitute. Even more perplexingly, particles have distinct, discrete level energy level and they don’t switch smooth between them, they jump. At the sub-atomic level the modern theory for this is called quantum mechanics. Back to economics. International trade in particular. The most empirically successful model in international trade – the so-called gravity equation – is based on Newtonian trade theory. The amount of trade between two nations varies with the product of the economic mass of the two nations and inversely with the distance between them. Strange as it may seem to students of Ricardo, Heckscher-Ohlin and the Krugman trade models, these three variables explain well over 50% of all variation in bilateral trade flows. No other trade model comes even close. The gravity model, in short, works impeccably at the level of aggregation available to empiricists – until recently. Work on firm-level data shows that the Newtonian smoothness was merely a product of empiricists not being able to look close enough. The results of a gravity model estimated on firm-level data in a Bruegel-CEPR book released yesterday by Gianmarco Ottaviano and Thierry Mayer show that most of the action in the gravity equation is coming from discrete changes in the number of firms exporting to a particular nation. The famous paper JEP piece by Bernard, Redding and Schott (2007) estimates similar regressions on US data and finds similar result. The chart (which is from their CEPR Policy Insight) illustrates how bilateral distance dampens bilateral trade and how destination market GDP increases it. Estimates of gravity equations on firm-level data find that the elasticity of trade with respect to distance is about -1.0 and that with respect to destination GDP is about 1.0. This is perfectly in line with the standard gravity theory and estimated obtained on aggregate data. The novelty here, however, is that they can decompose the total effect into what might be called lump size and number of lumps. The average bilateral sale of an exporting firm is the lump size, and the number of exporting firms is the number of lumps. The results show that gravity is not Newtonian (continuous); it is largely discrete (quantum). For example, 75% of the negative impact of distance comes through a reduction in the number of firms selling to a particular destination. The corresponding figure is about 60% for the impact of destination GDP. Of course, each lump is fairly small so for most purposes the number of versus size of lumps makes no difference. However, it does tell us something about the underlying mechanism driving the relationship. Standard gravity theory, the distance matters since it affects relative price (distance proxies for all manner of trade costs that raise the price of imported goods relative to local goods) and the destination GDP matters since it effects total expenditure on all goods in the market. In the new quantum gravity theory (expounded by, for example Melitz, Helpman and Rubinstein, or Chaney) a key new feature is the impact on firms decision to enter a market or not. Importantly, this decision depends upon the fixed cost of establishing a beachhead in a new market – what I have in the distant past called, beachhead costs in a 1988 article published in the American Economic Review. Why does this matter for trade policy analysis? The key addition is that this new insight from what might be called quantum gravity equations allows us to think sensibly about fixed trade costs, like technical barriers to trade that hinder the entry of new foreign varieties, or red tape measures involving after-sales service or distribution outlets. Quantum gravity equations won’t revolutionize trade like quantum mechanics revolutionized physics, but it is the new, new thing and it opens the door to sensible studies of a broader class of trade barriers. Explain is in inverted commas since we don’t think of as an explanation putting endogenous variables on both the left and right hand sides of the equation. For a primer, see Gravity for dummies and dummies for gravity models. This entry was posted in Uncategorized on 8 November 2007 by Guest.